U.S. stocks fell to a one-week low as the drop in health-care providers extended amid concern about policy changes and the latest batch of corporate earnings did little to boost confidence in the economy. Treasuries edged higher. The S&P 500 Index closed at 2,900 as health providers from UnitedHealth to Anthem and Humana tumbled. Merck fell the most in the Dow Jones Industrial Average, which slipped 26 points. 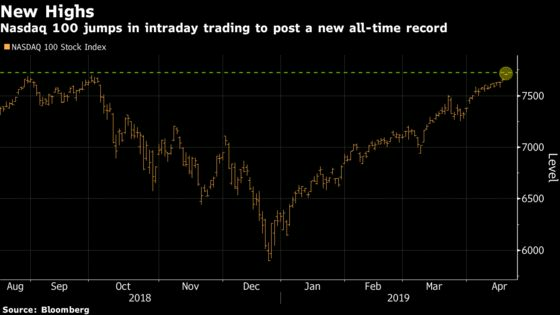 The Nasdaq 100 Index surpassed its August record after Qualcomm Inc.’s two-day surge topped 40 percent, though gains were tempered by a slump among biotech shares. The rout in health-care shares overshadowed the latest batch of earnings reports, which painted a mixed picture on the state of the economy. Morgan Stanley rose, but a rout in Bank NY Mellon weighed on financial shares lower. PepsiCo. Inc. jumped to an all-time high after posting solid results, while CSX Corp. and Kansas City Southern lifted transportation stocks. IBM Corp. slumped as sales fell. Health providers and hospital operators have come under pressure as national politicians debate the merits of expanding Medicare to all Americans, a move that has the power to upend earnings models for large parts of the system. “While there is still no convincing evidence legislative changes will have any negative impact on this year‘s earnings, it doesn’t help to have a major headwind emerge for an industry that was expected to be a driver of a second-half profit rebound,” said Alec Young, managing director of global markets research for FTSE Russell. The yield on 10-year Treasuries was virtually unchanged after climbing to a four-week high and the dollar fell amid data showing the U.S. trade gap unexpectedly narrowed. European debt also dropped, while the euro strengthened even as Germany’s economy ministry revised its growth forecast lower. Data overnight showing China’s economic growth, industrial production and retail sales all topped estimates boosted equities around the world. The Stoxx Europe 600 Index erased a drop, while shares rose in Japan and Shanghai. As earnings continue to pour in, investors are growing more confident the anticipated drop in first-quarter results won’t spoil the year. At the same time, central banks around the world remain accommodative, and the latest Chinese data appears to have calmed jitters that the world’s second-largest economy was headed for a slowdown. Earnings season rolls on this week, with reports due from American Express, Honeywell, Alcoa and Taiwan Semiconductor among others. A swathe of financial markets will close across the Western world for the Good Friday holiday, including in the U.S., U.K. and Germany. The S&P 500 fell 0.2 percent to 2,900.49 at 4 p.m. in New York. The Dow Jones Industrial Average fell less than 0.1 percent, while the Nasdaq 100 added 0.3 percent. The Stoxx Europe 600 Index advanced 0.1 percent. The MSCI All-Country World Index increased 0.2 percent. The MSCI Emerging Market Index jumped 0.3 percent to the highest in 10 months. The Bloomberg Dollar Spot Index dipped less than 0.1 percent. The euro gained less than 0.1 percent to $1.13. The British pound fell less than 0.05 percent to $1.3044. The Japanese yen was little changed at 112.045 per dollar. The yield on 10-year Treasuries was little changed at 2.59 percent after hitting the highest in more than four weeks. Germany’s 10-year yield added one basis point to 0.08 percent. Japan’s 10-year yield rose two basis points to -0.013 percent. West Texas Intermediate crude fell 0.1 percent to $63.96 a barrel. Gold futures fell 0.1 percent to $1,276.60 an ounce. The Bloomberg Commodity Index retreated 0.3 percent.